The Coconut Palm is a member of the palm family. 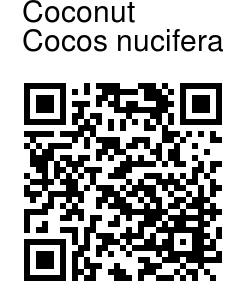 It is the only species in the Genus Cocos, and is a large palm, growing to 30 m tall, with pinnate leaves 4-6 m long, pinnae 60-90 cm long; old leaves break away cleanly leaving the trunk smooth. The term coconut refers to the fruit of the coconut palm. 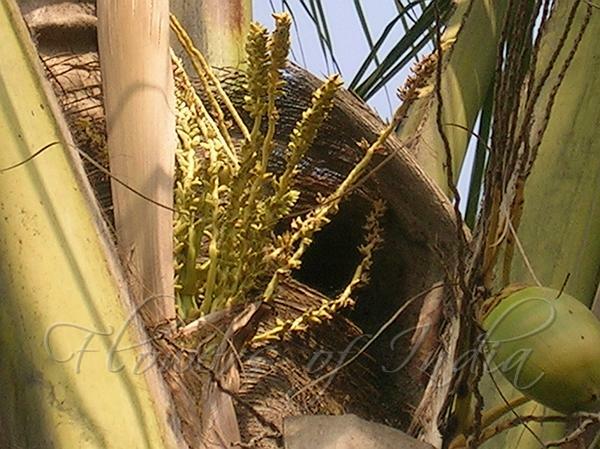 The flowers of the coconut palm are polygamomonoecious, with both male and female flowers in the same inflorescence. Flowering occurs continuously, with female flowers producing seeds. Coconut palms are believed to be largely cross-pollinated, although some dwarf varieties are self-pollinating. The origin of this plant are the subject of controversy with some authorities claiming it is native to southeast Asia, while others claim its origin is in northwestern South America. Fossil records from New Zealand indicate that small, coconut-like plants grew there as far back 15 million years ago. Even older fossils have been uncovered in Rajasthan & Maharashtra, India. Photographed in Imphal, Manipur & Nasik.